). He then received a boost to the tumor bed with an additional 14 Gy at 2 Gy per fraction to a total dose of 60 Gy. Since this is a postsurgical case, a preoperative diagnostic CT scan was fused with the treatment simulation CT scan to generate a CTV for the tumor bed and surrounding scar tissue. Next, using Radiation Therapy Oncology Group (RTOG) Atlas guidelines, the CTV for regional lymph nodes was generated. Finally, CTVs for the surgical scar/drainage site, L-scrotal sac, para-aortic nodes and L-renal hilum were generated. These CTV volumes were added together to create the CTV 46. The planning target volume (PTV) 46 is a 1.0-cm expansion of the CTV 46. A 1.0-cm bolus was used over a superficial portion of the PTV 46, which included the tumor bed and surgical scar/drainage site. The CTV 60 consists of the tumor bed and surrounding scar tissue portion of CTV 46. The PTV 60 is a 1.0-cm expansion of the CTV 60. The PTV 60 is also superficial, and a 1.0-cm bolus is used overall. the treatment; his counts had recovered toward the end of the course of the large-field RT and stabilized through his boost course. He was offered adjuvant chemotherapy due to high-grade disease, but declined. On a recent follow-up of 3 years, the patient has no evidence of long-term toxicities related to the treatment. His scans show no evidence of disease recurrence. ). There was no additional evidence of regional or systemic disease. Final pathology from the radical orchiectomy demonstrated high-grade inflammatory leiomyosarcoma from the spermatic cord measuring 11 cm in greatest dimension with only focal margin < 0.1 mm from the paraspermatic cord soft-tissue resection and no angiolymphatic involvement. Vas deferens, left testicle with cysts of epididymal appendages, and hydrocele were negative for malignancy. Soft-tissue sarcomas of the genitourinary tract are extremely rare malignancies. They account for 2% to 3% of all soft-tissue sarcomas and about 2% of genitourinary tract malignancies with paratesticular tumors being the most common.2 The most common reported malignant histological types include liposarcomas, leiomyosarcomas, rhabdomyosarcomas, malignant fibrous histiocytoma, and fibrosarcomas.3,4 They arise from mesenchymal cells of the spermatic cord (vas deferens or cremaster muscle), scrotum (dartos layer) or the epididymis. A typical presentation of a spermatic cord leiomyosarcoma is a growing testicular mass, firm and painless. The peak incidence is in the sixth to seventh decade. They are often mistaken for an incarcerated hernia. They most commonly arise from the spermatic cord and spread with direct extension through the inguinal canal and into the abdominal cavity; hematogenous or nodal spread is rare.5,6 Diagnostic tests include sonography (US), CT, or MR.5 US is the test of choice to rule out acute pathology such as incarcerated hernia or testicular torsion. CT or MRI provide additional information as it relates to the size and extent of the mass, as well as presence of pelvic or retroperitoneal lymphadenopathy. The primary treatment is surgical resection with radical orchiectomy and high ligation of the spermatic cord. Prophylactic retroperitoneal lymphadenectomy is not necessary unless there is evidence of nodal involvement or for sarcomatous histologies with a propensity for nodal metastasis, such as rhabdomyosarcoma.7 However, nodal involvement appears to be more common in paratesticular sarcoma than in other soft-tissue sarcomas with reports of nodal failure rates varying 14% to 28%.1 Due to this high incidence of nodal recurrence and primary location in the left side, we included the regional nodes extensively: left external and internal iliac lymph nodes, left inguinal lymph nodes, para-aortic lymph nodes, and nodes in left renal hilum area, which led to the long large field with more bone marrow in the field, which then likely caused cytopenias. Postoperatively, there are no well-established data on adjuvant therapy. In a review by Blitzer et al,7 71% of patients experienced local recurrence suggesting surgical excision alone is not sufficient and adjuvant therapy may be warranted. ). Without more rigorous randomized trial data (although unlikely to be established given the rarity of this malignancy), the role of adjuvant radiation therapy will likely remain uncertain; however, due to high risk of local failure, radiation therapy should be recommended for high-grade tumors, or close or positive margins. 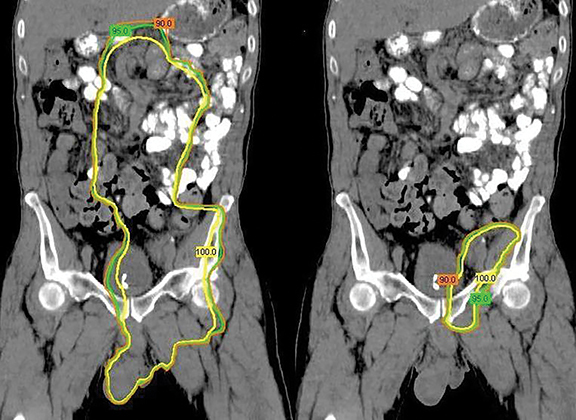 The role of adjuvant chemotherapy for soft-tissue sarcomas is controversial, and more so for spermatic cord sarcoma, due to scarcity of data. Pervaiz et al12 in a meta-analysis of 18 randomized controlled trials of adjuvant chemotherapy for soft-tissue sarcoma including 1953 patients, showed Doxorubicin and Ifosfamide did not improve local recurrence (OR 0.66, CI 0.39 to 1.12); but it improved distant recurrence (OR 0.61, CI 0.41 to 0.92), and improved overall survival (OR 0.56, CI 0.36 to 0.85). This suggests a potential benefit for systemic chemotherapy to decrease the rate of distant metastasis and potentially improve survival. 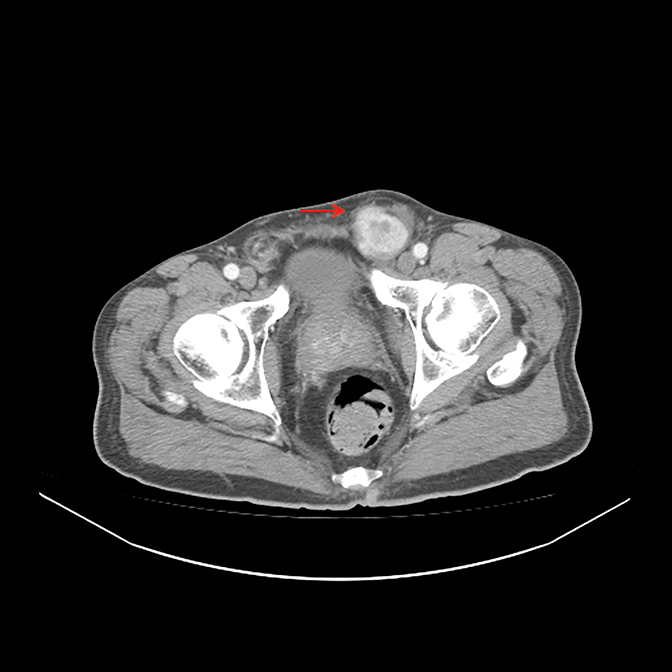 Spermatic cord sarcomas are rare malignancies with limited data on optimal management. Surgical resection with radical orchiectomy and high ligation of the spermatic cord is the primary treatment. Adjuvant radiation should be recommended for higher grade tumors or close/positive margins to improve local control. Systemic chemotherapy may be beneficial to decrease the rate of distant metastasis and improve potential survival. Additional studies are required to better understand spermatic cord sarcomas and to develop optimal treatment modalities. Cox JD, Stetz J, Pajak TF. Toxicity criteria of the Radiation Therapy Oncology Group (RTOG) and the European Organization for Research and Treatment of Cancer (EORTC). Int J Radiat Oncol Biol Phys. 1995;31(5):1341-1346. Russo P, Brady MS, Conlon K, et al. Adult urological sarcoma. J Urol. 1992;147(4):1032-1036. Rodriguez D, Olumi AF. Management of spermatic cord tumors: a rare urologic malignancy. Ther Adv Urol. 2012;4(6)325-334. Khoubehi B, Mishra V, Ali M, et al. Adult paratesticular tumours. BJU Int. 2002; 90(7):707-715. Ap Dafydd D, Messiou C, Thway K, et al. Paratesticular sarcoma: typical presentation, imaging features, and clinical challenges. Urology. 2017;100:163-168. Fisher C, Goldblum JR, Epstein JI, Montgomery E: Leiomyosarcoma of the paratesticular region: a clinicopathologic study. Am J Surg Pathol. 2001,25:1143-1149. Blitzer PH, Dosoretz DE, Proppe KH, Shipley WU. Treatment of malignant tumors of the spermatic cord: a study of 10 cases and a review of the literature. J Urol. 1981;126(5):611-614. Catton CN, Cummings BJ, Fornasier V, et al. Adult paratesticular sarcomas: a review of 21 cases. J Urol. 1991;146(2):342-345. Ballo MT, Zagars GK, Pisters PW, et al. Spermatic cord sarcoma: outcome, patterns of failure and management. J Urol. 2001; 166(4):1306-1310. Fagundes MA, Zietman AL, Althausen AF, et al. The management of spermatic cord sarcoma. Cancer. 1996;77(9):1873-1876. Hazariwala R, Morris CG, Gilbert S, et al. Radiotherapy for spermatic cord sarcoma. Am J Clin Oncol. 2013;36(4):392-394. Pervaiz N, Colterjohn N, Farrokhyar F, et al. A systematic meta-analysis of randomized controlled trials of adjuvant chemotherapy for localized resectable soft-tissue sarcoma. Cancer. 2008;113(3):573-581. Beydoun B, Weinberg B, Hurst N, Khoury N, Ahmed S, Kasza T, Cher ML, Tang K. A case of spermatic cord leiomyosarcoma: Clinical presentation, treatment and literature review. Appl Rad Oncol. 2017;6(4):37-40. Dr. Beydoun is a PGY4 resident, Section of Radiation Oncology, and Dr. Cher is professor and chair, Department of Urology, Karmanos Cancer Institute, Detroit, MI. Dr. Weinberg is an attending radiation oncologist, Department of Radiation Oncology, Pardee Cancer Center, Hendersonville, NC. Dr. Hurst is an attending radiation oncologist, Department of Radiation Oncology, Loyola University Medical Center, IL. Dr. Khoury is section chief, Section of Pathology; Dr. Ahmed is section chief, Section of Medical Oncology; Mr. Kasza is a therapeutic medical physicist, Section of Radiation Oncology; and Dr. Tang is an attending radiation oncologist, Section of Radiation Oncology, John D. Dingell Veterans Affairs Medical Center, Detroit, MI. Disclosure: The authors have no conflicts of interest to disclose. None of the authors received outside funding for the production of this original manuscript and no part of this article has been previously published elsewhere.